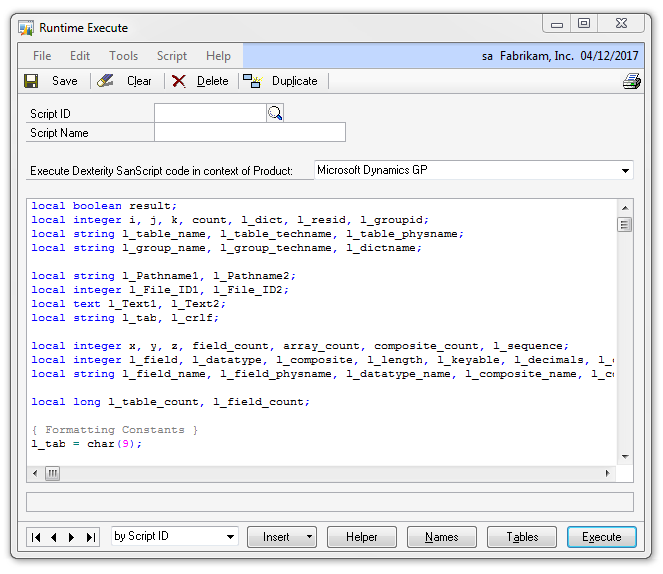 Since I have posted a lot of Dynamics GP table information and SQL code, I often get asked the question “what table holds ____ “? Sometimes I just know the answer off the top of my head (yeah, I think that’s scary, too), but once in a while I have to look it up. I have various ways of doing this, sometimes it involves glancing through the list of tables, other times I have used the Support Debugging Tool created by David Musgrave. 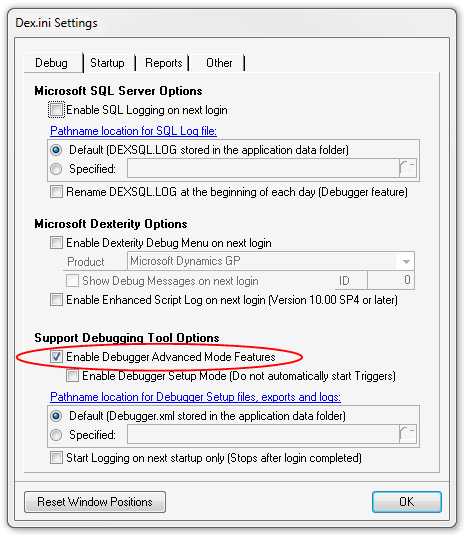 Open the Support Debugging Tool by clicking Ctrl+D or navigating to GP > Tools > Support Debugging Tool. Click OK to get back to the main Support Debugging Tool window. Click Execute in the bottom right corner. If you want to save this code for use in the future, enter a Script ID and Script Name at the top of the Runtime Execute window and click Save. Otherwise, you can just close this window and choose to Discard your changes. Now you have two text files with your data. The easiest thing to do is open Excel and open one of the files, this will automatically open the Text Import Wizard. In my experience you can just click Finish on the very first step and Excel will do the rest. Repeat the process for the second file, save them in Excel format and now you have searchable files of the tables and fields for your GP installation readily available. David has provided samples of the TABLES.TXT and FIELDS.TXT files in his post so that you can take a look at what kind of data you’d be getting. One huge benefit of going through the steps above instead of just using the samples provided is that any ISV products you have installed will be included when you run this on your system. I would like to thank David for making this available to all of us! Thanks for posting the details of how to use it!